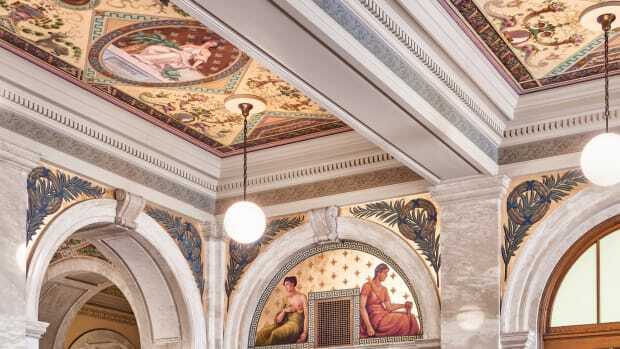 Read about how the team at BVH Architecture delivered an accurate mural restoration in Omaha's Douglas County Courthouse with methodical forensics and architectural detective work. Before restoration the mural showed paint loss, inappropriate infill painting and suffered from poor lighting. 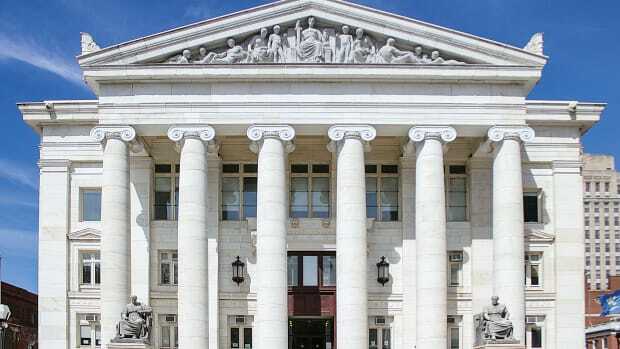 Since the installation of the Hall of Justice murals in the Douglas County Courthouse in Omaha, NE, in 1912, the murals have endured mobs, fire, water infiltration and multiple insensitive infill painting campaigns. 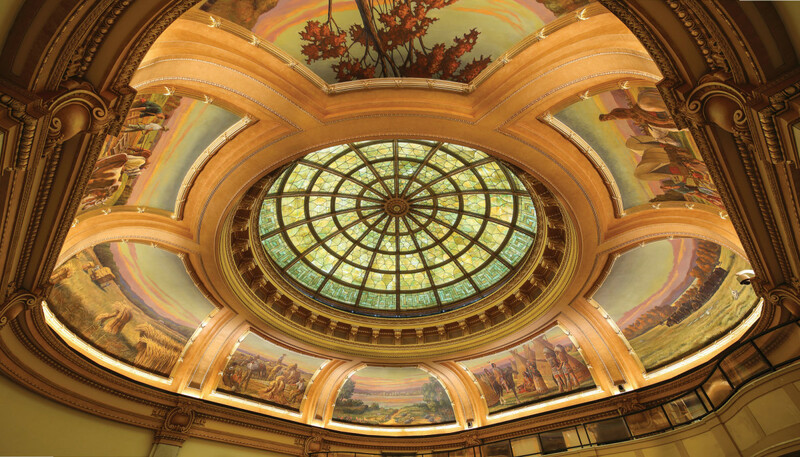 They are part of a complex and richly ornamented setting for a stained-glass dome in the courthouse. Omaha architect John Latenser was responsible for the monumental French Renaissance Revival style building. The murals were the work of William Rau. They depict a veritable history of the expansion of the United States in the Midwest: Native American encampments, the coming of white settlers, the growth and culture of agriculture, and the importance of the Missouri River. 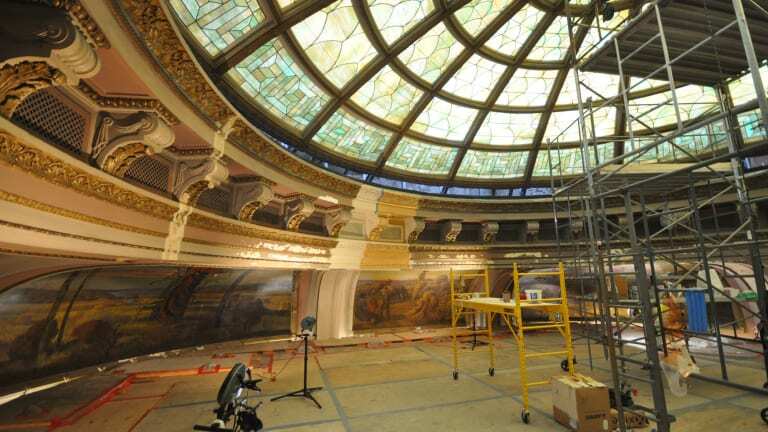 The restoration of the stained-glass dome, completed in 2010, solved a long-term water infiltration problem and set the stage for restoring the murals. 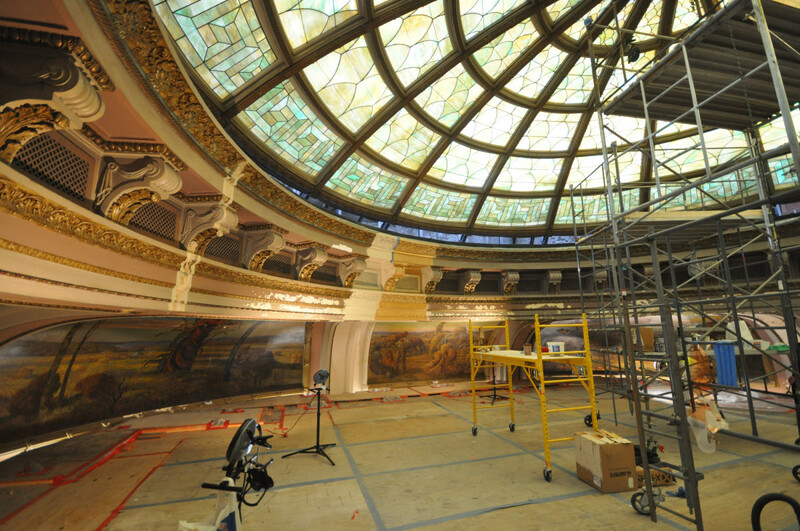 Better lighting highlights the extensive restoration of the skylights, lay lights, mural and entablature. The installation of art in public places is a humane effort. “Anything we can do to improve anyone’s experience in a courthouse helps; people are usually in court for less than pleasant reasons,” said Paul G. Cohen, Administrator of the Omaha Douglas Public Building Commission. When the recession hit the county budget in particularly harsh and inhumane ways, the mural restoration had to wait. By 2016, business was improving, resulting in growing revenue, and the Building Commission took up the charge. Dr. Ronald Roskens, Commission Chair, turned to the local community and within a few weeks raised half of the money needed for the restoration. With such a resounding vote of confidence from the Omaha philanthropic community, the commission voted to include the matching funds in its budget. 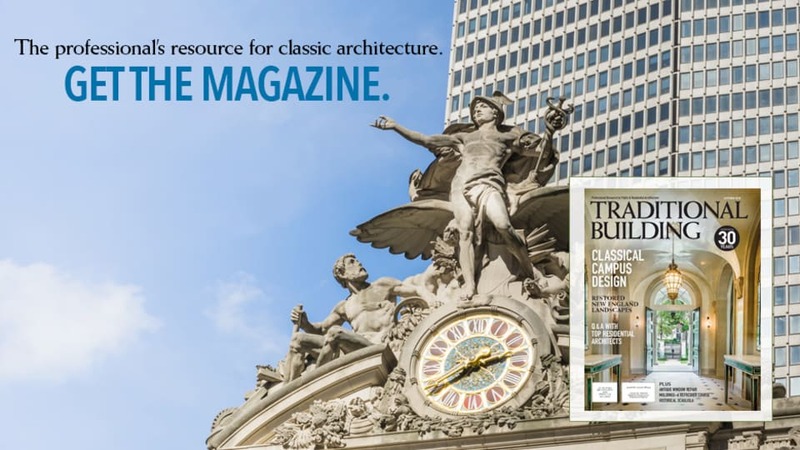 As most Traditional Building readers know, architects, owners and buildings often develop long-term relationships to see projects through to completion. Dan Worth, AIA, FAPT, is a principal with BVH Architecture that has offices in Lincoln and Omaha. Dan has worked with Paul Cohen and the Omaha Douglas Public Building Commission to steward the courthouse for more than 20 years. Mockups were used to assess the combination of finishes and colors that the paint analysis had revealed. 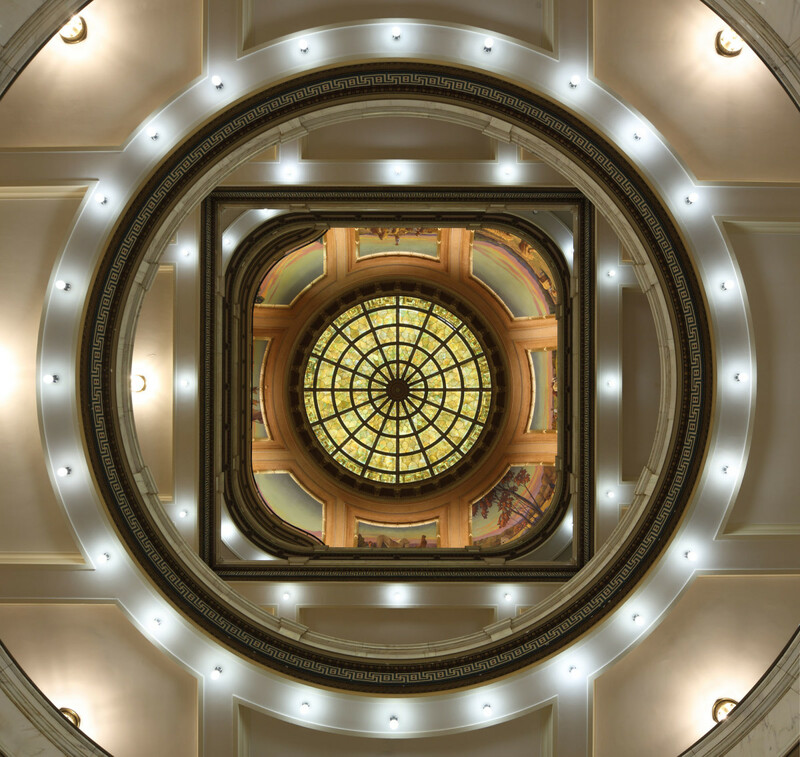 He had worked on the skylight and laylight restoration; he and his team, including conservators from Evergreene Architectural Arts directed by Terry Vanderwall, had done as much analysis as they could from the fifth floor. However, in order to proceed safely and efficiently, a 55x55x90-ft. scaffolding system was erected 5½ stories up under the rotunda. The deck floor was placed about six feet below the ceiling of the dome. The project begun in November 2016 was completed by May 2017 with the safety of the workers, building employees and the public assured by the enormous scaffolding. The Evergreene Architectural Arts team revealed exposure windows and conducted paint analysis to determine original color schemes, understand subsequent painting campaigns and to document materials. Some of the murals were restored in the company’s New York Studio on their original canvases and some were so deteriorated they were completely repainted on new canvas. Some of the earlier mural restoration work had removed canvas and painted directly on the plaster niches. Cleaning and varnish removal were completed as well. The entablature under the dome was analyzed and evaluated using exposure windows and paint analysis and repainted and gilded based on testing results. 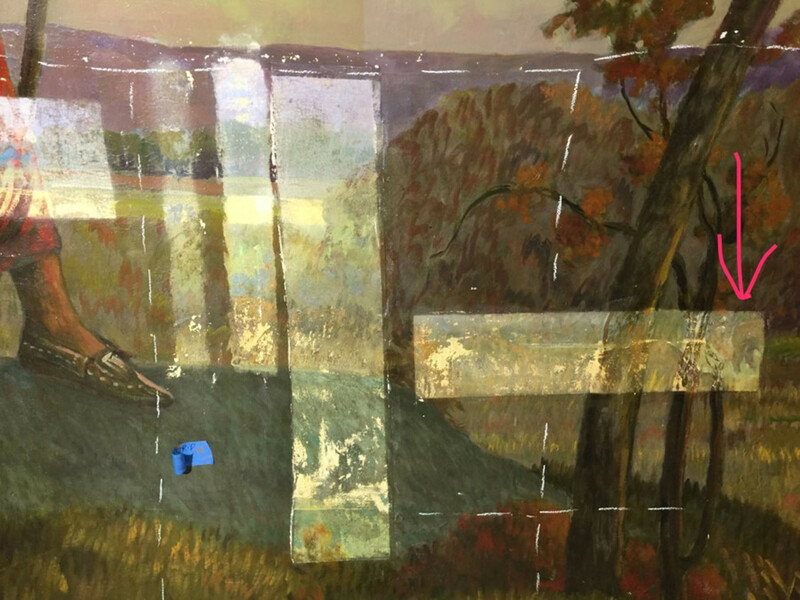 Prairie Scene window exposures aid in assessing damage and determining what was original to the canvas and what had been added. Simultaneously, the BVH team went to work documenting and assembling archival information: building plans, newspaper articles and other historical items were gathered, studied and prepared for the creation of a new building archive that will serve the needs of future building restoration efforts. The badly damaged canvases that could not be restored due to severe deterioration have been prepared for long-term archival storage in the new archive, for example. When the canvases were re-applied after the plaster restoration, some were cut into sections to accommodate the curvature of the plaster niche. The lighting system under the mural panels was upgraded during the project to LED fixtures, saving energy, lessening the impact of light degradation and improving the view for the public. The restored murals are waiting to be unwrapped for reinstallation. Final murals and stained glass after restoration. The benefits of a long-term partnership between architect and the board and staff are evident in this project. Trust was a key factor in the project’s success given that the final analytical work could only be done once the scaffolding was in place. 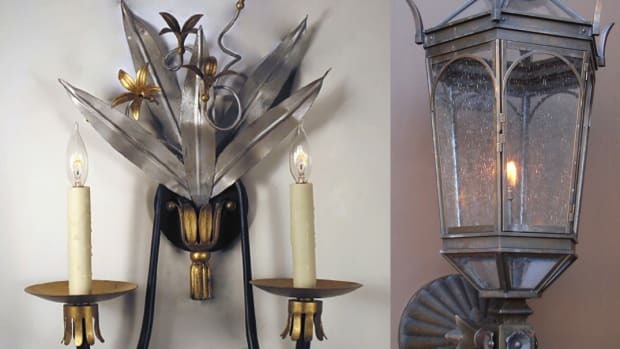 Architect Dan Worth can be reached at dworth@bvh.com and conservator Terry Vanderwell can be reached at tvanderwell@evergreene.com for more information. 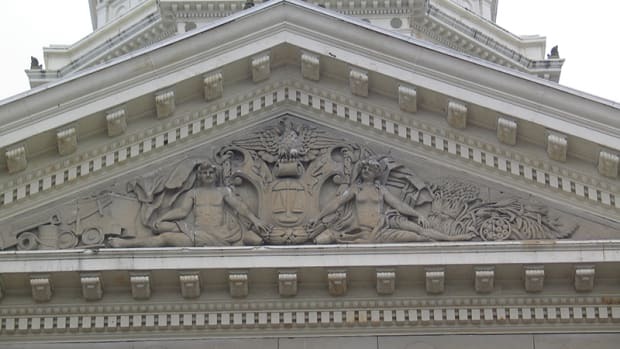 John Canning & Co. conserves a legacy of art and craftsmanship in the Luzerne County Courthouse.